Freezing weather is no stranger to the Michigan area. But when temperatures start dropping in winter, you want to make sure your home’s furnace or boiler is going to last for the entire season. And though some problems can be fixed with a heating repair in Detroit, sometimes it makes sense to go ahead and have your furnace replaced. Having a new furnace installed at the right time can help you save on utility costs while also ensuring your home is comfortable during the harsh winter months. So how do you know when it’s time? Actually, it’s not all that difficult. If you pay close enough attention, your furnace or boiler will tell you. Still not sure about needing a new furnace or boiler? Then let Andy’s Statewide look at it! Our expert technicians can give you their professional opinion. And if you decide it’s time, we can help you find a furnace for your Detroit, Ann Arbor, Troy, MI or surrounding area home that will fit your budget. And remember, every unit we install comes backed with Andy’s Statewide Exceptional Service Guarantee. Either you are completely satisfied or we will do whatever is necessary to make it right. And if you’re on a tight budget, don’t worry about that either. With proper credit, you can take advantage of our easy payment options. With great reasons like those listed above, now is the time to replace your old furnace or boiler. 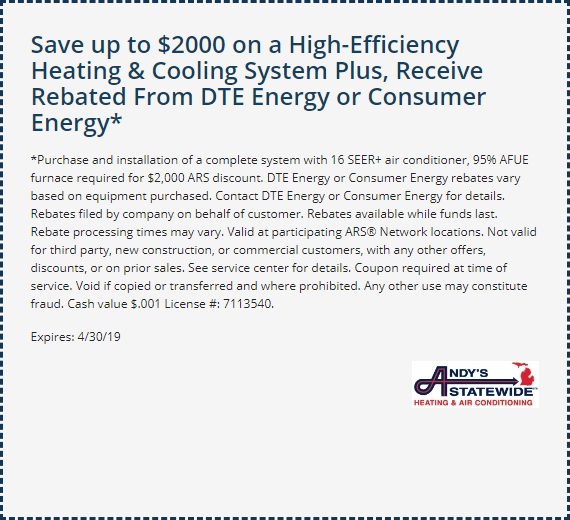 There’s no reason to spend another day shivering indoors, call Andy’s Statewide today.